The Son of Man - a graphic novel in water colour, based on the four Gospels in the New Testament - is the outcome of more than three years' work with text and interpretation, numerous sketches, research in Israel and 136 painted pages. The unique combination of text, pictures, shapes, colours, light and shade, lines and different points of view makes for a visual approach to the story about the life of Jesus. Through the universal thoughts and questions of Peter the Disciple, the immortal story comes to life. 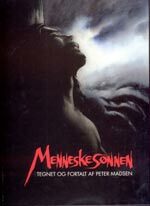 The Son of Man has become a classic in Denmark, used by most priests in their confirmation classes and in schools. So far, 150,000 copies have been sold in Denmark. The book has appeared in Danish, French, Swedish, Norwegian and Faroese and has received a number of domestic as well as foreign prizes. The Danish Bible Society has published an educational companion to The Son of Man, written by religious educator John Rydahl, and a series of 22 slides from the book. The posters "Walking on the Lake" (page 46), "The Supper" (pages 100-01) and "The Baptism of Jesus"
(page 15) can be bought from the Danish Bible Society. Sketches : Jesus, a fishing boat, from the Wailing Wall. Click here to buy The Son of Man.